Click to watch the video & get your Secret Code! Must be a US resident. This is not an international giveaway. Must enter secret code after watching the video here. 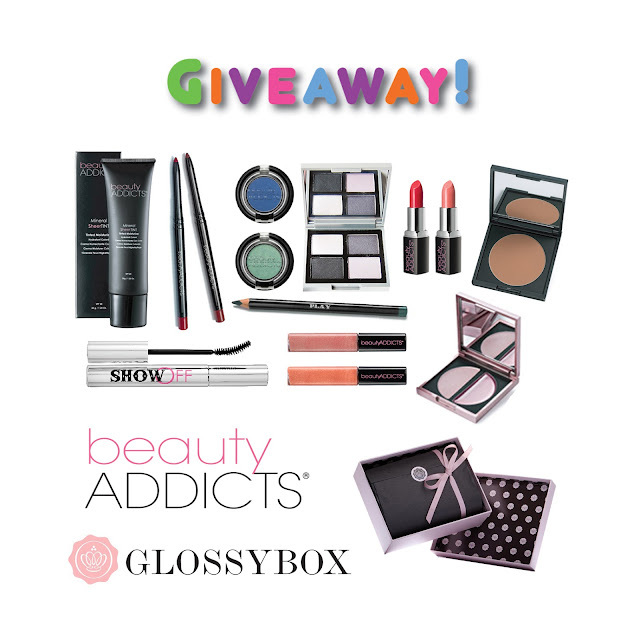 Must follow Beauty Addicts and Glossybox on Facebook. Additional entries increase your chances of winning and add up to a total of 40 entries. This giveaway ends August 1, 2013 at 12:00 AM EST. Three winners will be randomly chosen, announced and contacted on 8/1/13 after which, each winner has 24 hours to respond, otherwise a new winner will be chosen as a replacement, again at random. what if you dont have a facebook ? I AM A FAN OF CLINIQUE BUT AM WILLING TO TRY THE GLOSSY SINCE U MENTIONED THEY ARE SKIN CARING TOO, AND IF I LIKE IT I'LL BE BUYING THEM FROM NOW ON.SO EXCITED! One of your newest fans and the Beauty Addicts line sounds perfect blending skincare and makeup into some of the best beloved products. Love the chance to win this HUGE haul.